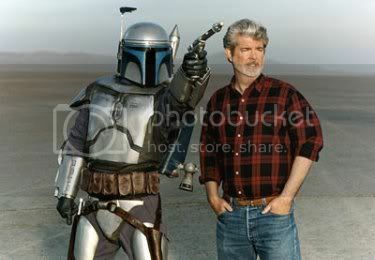 When I mention “George Lucas” and “ridiculous” in the same sentence, your thoughts likely turn to The Phantom Menace, Jar Jar Binks, or a warehouse chock-full of of plaid shirts. But Lucasfilm’s antics also extend to the legal realm. Inspired by news of a lawsuit brought against Star Wars prop designer Andrew Ainsworth for selling supposedly-unlicensed Stormtrooper costumes, I uncovered five of my favorite ridiculous lawsuits involving Lucasfilm and/or George Lucas. Ok, I can get behind Lucasfilm protecting itself against blatant rip-off artists, but… getting into a trademark dispute with social news Web site Digg over a computer game released in 1995 called “The Dig“? Lucas dropped its “notice of opposition” after an out-of-court settlement. As indicated in the lawsuit, Lucasfilm thought that consumers could be confused into thinking that Lucasfilm sponsored or produced the X-rated film. Right. Heh. The producers of Starballz thought that was pretty funny, too. They filed a $140 million countersuit against Lucas for libel. The judge ruled against Lucas in the original case–because, yeah… no one in their right mind is going to associate a pornographic cartoon parody of Die Hard with LucasFilm–and I’m guessing the big countersuit made its way to wherever frivolous lawsuits go to die. Dr. Dre made quite a stink over mother-effin’ Napter users stealing his mother-effin’ music. Oh, delicious irony when–exactly one day after Dre had issued a warning to Napster to remove all of his songs from their service–Lucasfilm sued the good doctor for copyright infringement of their THX “Deep Note” sound in one of his tracks. He ended up paying them a settlement. 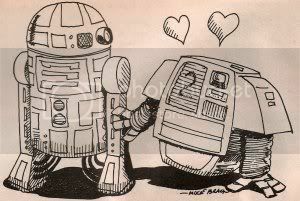 George Lucas meets with Douglas Trumbull, the director and special effects chief on 1972’s Silent Running, and is all, “Hey, I like those two-footed robots you’ve got, there.” Four years later, the world gets R2-D2 and other biped ‘bots in Star Wars. In other words, Star Wars blatantly rips off Universal’s Silent Running. Universal Studios is all, “Hey, no copycats!” And sues 20th Century Fox. The original working title for Battlestar Galactica (BSG) was Star Worlds. Ahem. The creator of BSG, Glen Larson, claimed he was working on his show long before Lucas’s film came along. He even met with a Star Wars producer during production and agreed not to use “laser streak” effects, supposedly to avoid claims of similarities between the two properties. Important note! George didn’t actually participate in this particular lawsuit, since he didn’t own the rights that were supposedly getting infringed-upon. How Star Wars Conquered the Universe: The Past, Present, and Future of a Multibillion Dollar Franchise – You will not get any more “behind the scenes” of the building of the LucasFilm empire than you will in this deeply-researched and entertaining book by a veteran media journalist. The People vs. George Lucas – A hilarious and heartfelt documentary featuring pointed questions–and answers–about Lucas’s legacy. I had the chance to go to Lucas Ranch once — and if you think about all of those people just sitting around plush offices trying to justify their existence it’s no wonder there are lawsuits aplenty. And I’m man enough to admit that Silent Running was the first movie that ever made me cry (when I was, like, 5 years old). 2. Star Wars was a retarded name for the space defense program. It might as well have been called Star Trek or the Blob it was so obvious that they were using the film’s name. So I think I’d be pissed about that one. 4. Starballz is the worst thing I’ve ever seen. I can’t even qualify it as a movie or a film, it’s so pointless and boring it falls into the category of mind torture. 5. Digg and Dig? Come on, that’s so retarded.